A rugged, durable, top notch prosumer machine that only misses perfection because of a few quirks of operation. Recommended for: Power drinkers, coffee purists, large households, business environments. Not recommended for casual use. Are you an old-school person, trapped in the modern world? A committed Do It Yourselfer who loves a hands-on experience in everything you do? Do you see the making of specialty coffee drinks as a craft to be perfected – one part art, and one part science? If you answered yes to any of those questions, then you’re going to love our in-depth Bezzera Unica review. This machine is close to perfect. In fact, the only reason it didn’t get a perfect five-star rating from us is that there are a few operational quirks you have to get used to. Once you do, however, you can make some amazing coffee magic happen with this machine! In the sections that follow, we’ll go into detail about what this machine can do, what it does well, and the few things it just wasn’t designed for. That way, you’ll have a clear picture so you can make an informed purchasing decision. 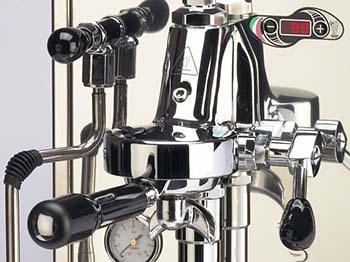 The first thing you’ll notice about the Bezzera Unica espresso machine is the fact that it’s almost entirely old-school. Dominated by knobs, levers, gauges and buttons, the Unica places minimal emphasis on modern electronics, featuring only a single, small PID for boiler temperature control on the front face of the machine. This Old-World aesthetic is paired with rugged, durable stainless steel construction. You won’t find any cheap ABS plastic here! Measuring at 16” x 11” x 17,” it’s not a compact unit, but still small enough to make it fairly easy to find it a permanent home, even in kitchens where counter space is at a premium. That’s a good thing because this brute weighs in at a hefty fifty pounds, so it’s not something you’re going to want to move about unless you absolutely have to. Note that its industrial/commercial appearance may make it clash with some home kitchen décor schemes. It’s doubtful that this would be a deal-breaker for many, but it is something to keep in mind. If you’re okay with the overall aesthetic, then you’re probably going to love the rest of the machine! This is an important part of our Bezzera Unica review, and as power drinkers ourselves, this is one of our first questions about any new machine we’re reviewing. On this front, the Unica delivers in style, offering an impressively sized 3-liter, top loading water tank. First, there’s no option for a dedicated water line. If you’re looking for a prosumer-grade product that offers that feature, this isn’t the machine you want. Second, no water filter. That’s not a deal breaker either, but it does mean that you’ll have to resign yourself to periodic descaling, unless you use distilled water in the tank, or filter it from some other source. Third, there’s an auto-fill feature that works when pulling shots, so that the boiler refills from the tank automatically. That’s handy, but there are two drawbacks. The first is the fact that it’s impossible to tell the tank’s water level without physically opening the top hatch and peeking in, so as big as it is, you’ll want to keep a close eye on it. Fourth, the auto fill feature doesn’t work with the steam wand, so after steaming 2-3 drinks, you’ll want to manually flip the switch on the front panel to refill the boiler manually – this is one of those “operational quirks” we mentioned earlier! This will be a short section, because as a semi-automatic, the Unica doesn’t have a built-in grinder, so it’s just not capable of providing “bean to brew” experience. That’s not a bad thing though! The biggest problem with super automatics and integrated grinders is the fact that you’re saddled with whatever grinder the manufacturer decides to give you, and the industry average is for grinders with six settings. That’s okay for most casual coffee drinkers, but more grind settings allow you to fine-tune the flavor of the drinks you’re creating, and there aren’t many super-automatics on the market that cater to this by offering grinders with a dozen or more settings. Sure, you can find them, but they are definitely in the minority. By purchasing your own standalone grinder, you are guaranteed to get exactly what you want. The other hidden advantage is this: super automatics almost universally warn you away from using Dark Roast beans, because the higher oil content gets caught in the grinding burrs, and being integrated into the system as a whole, they’re difficult to clean. Again, by buying a standalone (especially if you opt for a manual grinder), you get around that limitation. Since you’re going to have to buy a grinder, here’s our recommendation – steer clear of blade grinders. While incredibly inexpensive, they also don’t grind the beans as much as simply smash them to bits, resulting in grounds that are highly inconsistent. Also steer clear of stainless steel grinders, which heats up when used, and burn your grounds, ruining the flavor of your coffee. Get the best ceramic burr grinder your budget will allow, and you’ll be making world-class drinks every time you use the machine! 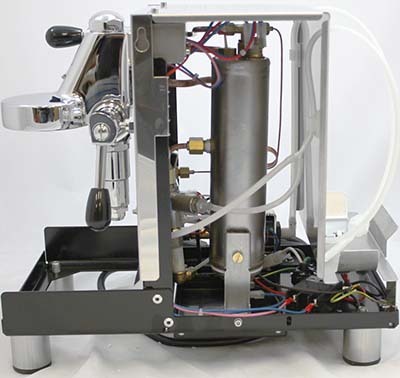 In keeping with its old-school design, the Bezzera Unica espresso machine utilizes a single copper boiler. 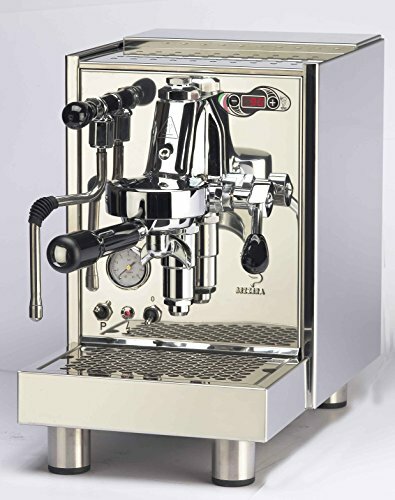 Note that most of the espresso machines being sold today use aluminum boilers, lined with stainless steel, so this is a nice touch, and copper is known for its excellent, rapid and even heating properties. The boiler is tied to the venerable E-61 commercial brew group and to a PID on the front face of the machine that allows for precise temperature control. We’ll have more to say about both of those features in a later section. For the moment, we just wanted to make a quick note of them. Bezzera machines are built to last and are incredibly durable, so when you open the machine up, you’ll find nothing but quality components inside. Again, note the solid stainless steel interior, and the almost complete absence of cheaper plastic components that just don’t have the same longevity. In this respect, the machine is designed with dedicated Do It Yourselfers in mind, because if any component fails, it’s a simple matter to swap out that component and get the unit back into service quickly. This will be another short section because the coffee spouts on semi-automatics are fixed in their positions, being located at the bottom of the portafilter used. 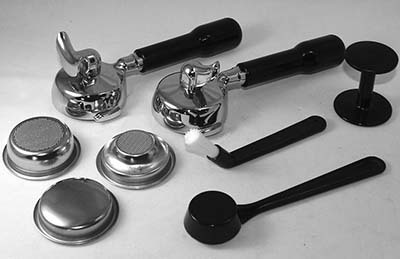 When you buy the Unica, you get two portafilters – one for single, and one for double shots. Also included are a backflushing disc and a plastic tamper. This last item, you’ll probably want to upgrade to something better, and we were a bit underwhelmed to see a plastic tamper included with such a robust machine. It’s not a deal breaker, and you can certainly use the plastic tamper in the beginning, but eventually, you’re almost certain to want to upgrade it. 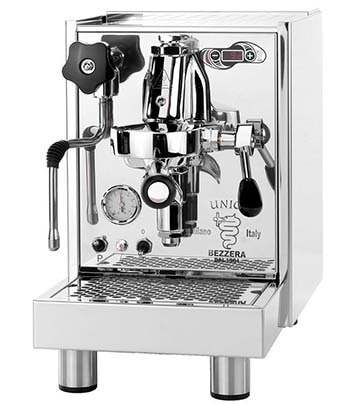 This is the heart and soul of any espresso machine, and the Bezzera Unica is no different. Here, there’s a lot to like, and some quirks to be aware of. Let’s start with the good. The Unica is built around the commercial grade E-61 brew group. It’s been around for a long while and is the standard by which all others are judged. To say that it’s exceptional would be selling it short. Capable of pulling up to twenty shots and hour, it can keep pace with even the most diehard coffee drinkers in a large household, or in a busy office environment, especially when coupled with an expensive water reservoir, which this model has. Even better, the gauge on the front face of the machine tells you exactly what your pump pressure is, so you’ll always know where you stand, and can make as-needed adjustments and measure their impact. 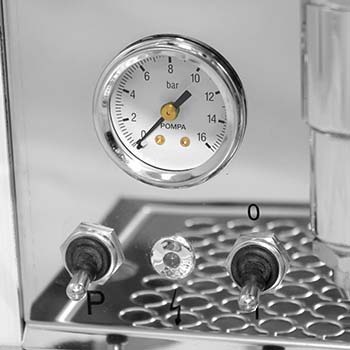 Having the information that the pump pressure gauge provides also allows you to intentionally set your pressure higher or lower than the standard nine bars used when making espresso, if you want to experiment with other extraction techniques, which is magnificent. 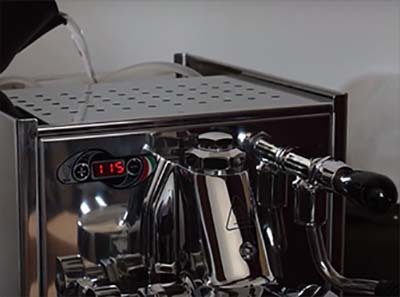 Best of all, the Unica boasts a PID on the front panel of the machine, which allows you to precisely control both your steam temperature and the temperature of the boiler when pulling shots, which we’ll go into more detail on in the next section. Here’s another of the machine’s “operational quirks.” Using the PID to change temperature can be a bit of a challenge. It’s easy enough to switch between steam and boiler temperature displays, but you’ve only got about two seconds to start changing the temp with the “+/-“ buttons. If you miss the window, then you’ll have to start the process again. This isn’t a big deal once you get the hang of it, but it can make you feel a bit like one of the Keystone Cops in the beginning, as you race to try to get the temperature set, only to fail and have to start over. Our Bezzera Unica PID review would be incomplete if we didn’t call special attention to this feature. 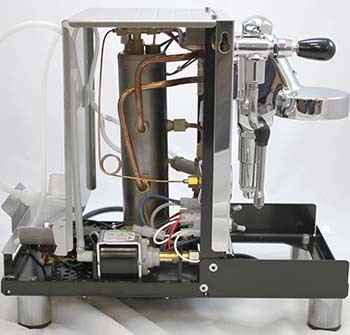 Although it’s certainly true that with its single boiler, the Unica is better suited to pulling straight shots of espresso and ristretto, the frothing wand is excellent and armed with it there’s no end to the variety of specialty drinks you can create. The steam function on this machine is beyond impressive. Sure, there’s a bit of wait time as the boiler shifts gears from coffee mode to steam, but once it starts, hold onto your hat! Some semi-automatics suffer from a sub-par steam function, but that’s certainly not the case here. In fact, part of the learning curve with this machine involves not burning your milk! People who are new to the world of specialty coffee are sometimes intimidated by the wand, but don’t be! While it’s true that it takes patience and practice to learn well, it’s a skill that anyone can master, and once you’ve got it – you’ve got it! (although as a side note, if you’re learning on this machine, then it will spoil you with its steam power and speed, and most other machines on the market will leave you feeling a bit underwhelmed). 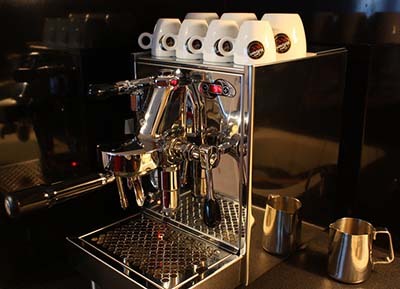 There’s not a lot to say on this front, except to note that the Bezzera Unica espresso machine does indeed have a passively heated cup warming tray and that it plays a surprisingly important role in the quality of the drinks you produce with the machine. The secret lies in the warming tray’s ability to mitigate heat loss. That matters because specialty coffee drinks were meant to be enjoyed at temperatures somewhat lower than most Americans like their coffee, and when you dispense your drink into a cold cup, you lose a tremendous amount of heat, which can make the problem worse. If you’re not convinced it makes much of a difference, try a simple experiment: Brew two of your favorite drinks. Dispense the first one into a cold cup and the second into one you’ve had on the warming tray for a while. You’ll be convinced! In a previous section, we talked about the quirkiness of the machine. They matter, and as such, are an important part of our Bezzera Unica espresso machine review, especially if this is your first semi-automatic, because they could increase the slope of the learning curve, and until you master them, your shots and other specialty drinks may not turn out quite the way you had hoped. Once you do master the machine’s use though, you’ll find those quirks to be an endearing part of the process of crafting the drinks you make and will wonder why some people make a big deal of them. This last bit deserves further explanation, especially if you’ve never used a semi-automatic machine before. Backflushing is to the Unica what cleansing tablets are to super automatic machines. It is the means by which you flush the system and keep the brew unit clean. About once a week, you’ll want to use your backflushing disc, put some milk cleanser into it, and cycle the pump on and off several times to run the cleanser through the system. Do that, then rinse well, and you’re all set. 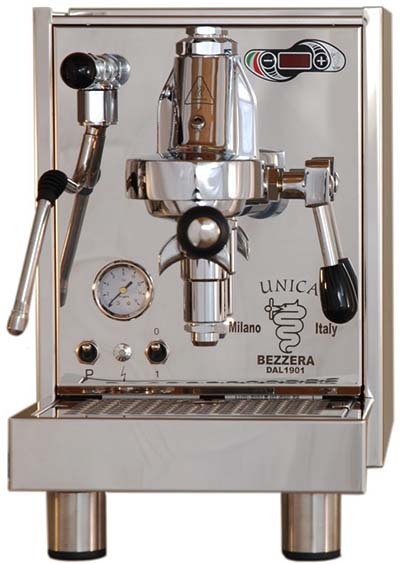 With proper care and maintenance, the Bezzera Unica will provide you with a decade or more of reliable service. Its durability is a thing of legend, and it will serve you well. We’ve outlined the various strengths of the Bezzera Unica espresso machine above, so we won’t rehash them here except to say that there’s an awful lot to like about this machine. Quirky Operation – This isn’t necessarily a bad thing, but the quirks we mentioned can make the machine feel as though it’s fighting you, especially when you’re first learning to use it. No dedicated water line – This one might be a big deal if you’re buying it for a busy office environment, but shouldn’t be a problem for home users. Still, some people buy a prosumer grade product specifically for the dedicated water line, and this one doesn’t have it. If you can live with both of those machines, and you drink enough coffee so that the Unica isn’t massive overkill, then it’s a great unit, and belongs on your short list! And that wraps up our Bezzera Unica review. As you can see, this model has a lot going for it and offers tremendous capabilities for the money. While it’s overkill for the casual coffee drinker or smaller household, everyone else would get a lot of mileage and enjoyment from the Unica, even taking its operational quirks into account. If you’re new to the world of specialty coffee drinks, the quirks we mentioned above may make this a somewhat frustrating first machine, and make it more difficult to learn on, but for everyone else, it’s highly recommended. The Most Important Thing About Brewing Coffee. Barista Hustle. The Importance of Tamping Coffee. Guide 2 Coffee. What Coffee Is That? Foodwatch.